I have crazy sensitive skin and I am always looking for new products to try. Australian Bodycare offer a great range of tea tree based products that are kind and gentle to your skin but at the same time very effective. I have been using the deodorant now for just over two weeks and I am getting on great with it. We don’t often think about what we use under our arms but the skin is just as delicate and sensitive as your face! A few years go I developed an allergy to my deodorant and since then I have had to be very careful what I use or I end up with a rash and really dry areas. My favourite thing about this deodorant is that it smells lovely and fresh and you can just tell by the scent and the tea tree that it is good for your skin if that makes sense? It’s working great so far and I plan to continue using it 🙂 Oh and I forgot to mention its a roll on, which I prefer to a spray. The other product I have been trying is the skin wash, I have been using this all over in the bath and again, knowing it has tea tree in the product and being able to smell the fresh aroma just makes me feel so clean. Since using this my skin is in better condition. 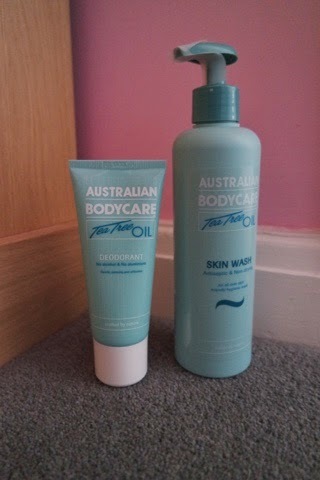 I am planning to try some more products from this range as I have been very impressed with these!